Sameer Ansar Writes: An Accident...learning...and unlearning. The public works department completed their contract on the pipes on the water works tender. The stones and rocks left over were kept away on the roadside. The iron bars were forgotten too. The sand was not moved off the road properly. The holes that were dug were left for others to fill. The workers went back home. The contractor went back home. 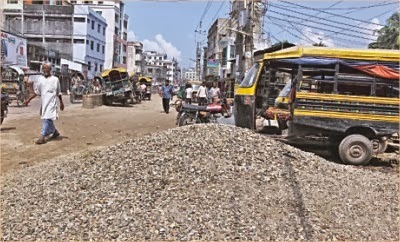 And the people who used the roads and paths started to use this damaged road with no complaints. The old man walked carefully over the stones so as not to slip. He walked onto the road to avoid the iron rods. The scooter swerved to avoid him. The car behind braked sharply. The lorry behind the car braked and skidded. The cars behind all braked. The scooters behind all skidded. The lorry went skidding over the pot holes and turned around. The driver of the Mercedes was driving at a 100 km/ph. He turned to look at the lovely lady at the bus stop. He did not see the lorry skidding towards him. The Mercedes collided and skidded over to the scooter on the other side. And instantly switched off the lives of a man, woman and a baby.